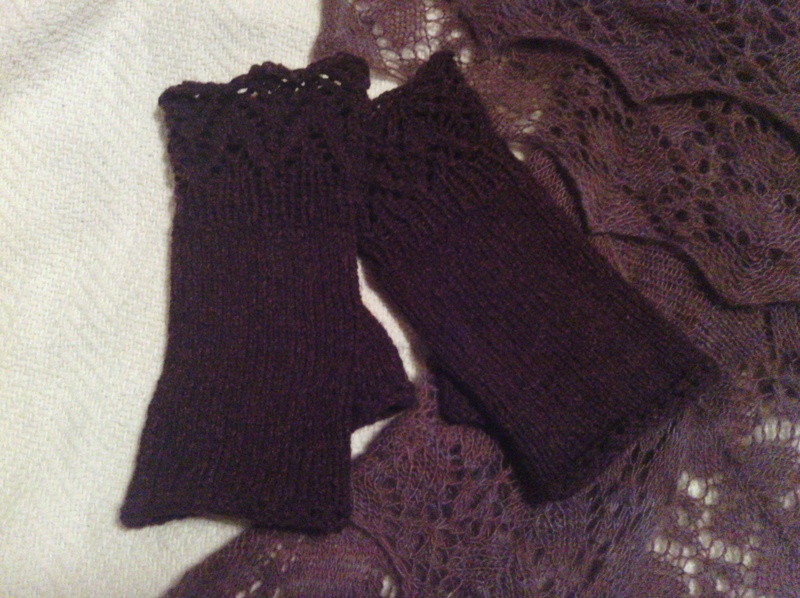 Just finished a pair of fingerless mitts to wear with the lace shawl I knit last year. Now I can knit in the car and still be warm. I used a merino-mulberry silk blend from my stash. I don’t remember what project I had in mind when I originally purchased the yarn, but it worked wonderfully for the mitts. The color is a deep red-purple so they were difficult to photograph. They have lace cuffs and an eyelet edging. This entry was posted in Knitting and tagged fingerless mitts. Bookmark the permalink. I love these mitts. It would be great to see a close up picture because the cuffs look exquisite. de quoi avoir chaud! pour le chaud au cœur à voir sur mon blog! merci! Oooh…I’ve been wanting some toppers for boots that would make me look like I’m wearing long socks with lace on top. I bet you could adapt this pattern, Mom, for your favorite daughter.